Chuck Brown -- jazz artist -- (August 28, 1936?May 16, 2012) was an African-American jazz guitarist, singer and the Godfather of Go-Go, which is a sub-genre of funk music from Washington, D.C. Brown's musical career began in the 1960s playing guitar with Jerry Butler and The Earls of Rhythm, joining Los Latinos in 1965. He still performs music today and is commonly known in the Washington, DC area. Brown's early hits include "I Need Some Money" and "Bustin' Loose". "Bustin' Loose" has been adopted by the Washington Nationals baseball team as its seventh inning stretch song. Brown's musical career began in the 1960s playing guitar with Jerry Butler and The Earls of Rhythm, joining Los Latinos in 1965. He still performs music today and is commonly known in the Washington, DC area. Brown's early hits include "I Need Some Money" and "Bustin' Loose". "Bustin' Loose" has been adopted by the Washington Nationals baseball team as its seventh inning stretch song. Brown also recorded go-go covers of early jazz and blues songs, such as "Go-Go Swing" Duke Ellington's "It Don't Mean a Thing If Ain't Got That Swing", "Moody's Mood for Love", Johnny Mercer's "Midnight Sun", Louis Jordan's "Run Joe", and T-Bone Walker's "Stormy Monday". He has influenced other go-go bands such as Big G and The Backyard Band, Rare Essence, Experience Unlimited (EU), Little Benny and the Masters, and Trouble Funk. The song "Ashley's Roachclip" from the Soul Searchers' 1974 album Salt of the Earth contains a famous drum break. Brown is considered a local legend in Washington, D.C., and has appeared in television advertisements for the Washington Post and other area companies. 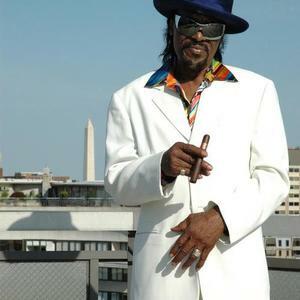 The D.C. Lottery's "Rolling Cash 5" ad campaign features Chuck Brown singing his 2007 song "The Party Roll" in front of various D.C. city landmarks such as Ben's Chili Bowl. Brown passed away on Wednesday, May 16, 2012 of multiple organ failure at Johns Hopkins Hospital in Baltimore, Maryland.